On a night, not too long ago, I stood in my apartment in New York City, phone in hand, incessantly “checking.” “Checking” to see if emails had been responded to; to see if texts had been read; checking to see if someone somewhere in the world had posted a pretty picture of a pretty plate of food somewhere in the vicinity of their pretty mouths. Mostly, I was giving my hands the satisfaction of perpetually skimming my phone screen like a nervous tic—a tactic to help me avoid my anxiety. My anxiety has always masqueraded as motivation; a headstrong desire to succeed, a dedication to my work, and to keeping up with the world around me. And, in many ways, this has worked for me. My anxiety has always masqueraded as motivation; a headstrong desire to succeed, a dedication to my work, and to keeping up with the world around me. But quietly, my fear of the future and fear of failing huddled on the sidelines of my mind like fans rooting against me. It took years of anxiety and many nights anxiously scrolling through my phone for me to finally realize: ignoring the present could hurt me. And it already was—it was one of the things that contributed to me feeling sad, sick, and severely nervous. So I decided to dip my toe into a new pool: the present. There are many ways we can alleviate our anxiety—exercise, medication, laughter, and various forms of therapy—but one method that’s available to us all, right here and now, without needing a specific health insurance plan or a having to take out a small loan from our bank is mindfulness. Non-judgemental awareness of the present moment and focused attention on an object, usually the breath, is a proven way to cope with anxiety. 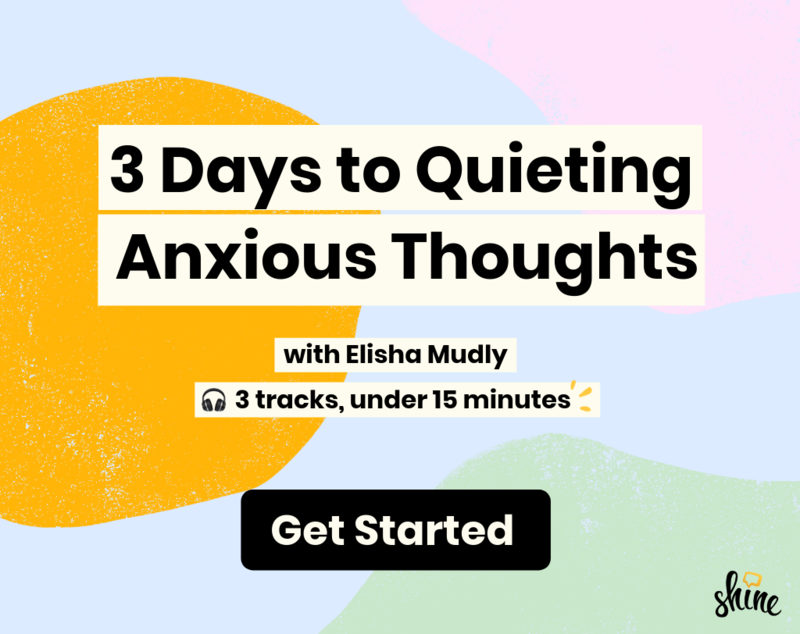 In my quest to cope with my anxiety I found some useful keys into accessing mindfulness. Here are a few. When I first learned about mindfulness, it didn’t feel like an intuitive practice. Hearing “get present” always came with a follow-up question: How? But I’ve since learned that “getting present” is about noticing what’s around you. “Getting present” is about noticing what’s around you. For me, that means tuning in to the sounds and sensations around me. The next time you’re feeling anxious, try this practice I call LLF: Look Listen Feel. ●︎ Look: Look around your environment and name some of the objects, colors, and shapes that you see. ●︎ Listen: Traffic going by? Birds chirping? Footsteps? Actively listen to the world around you. ●︎ Feel: Notice how your body connects to the ground beneath you—maybe it’s via a chair, or your feet, or the train that’s gently pulling you along to work. Feel what grounds you in this present moment. For me, it really helps to remember that even though you might envision something unfolding in a particular way, you simply cannot account for all the factors that will change things. The surprise traffic jam, the last-minute assignment, the rain that no one predicted—we can’t control the unexpected, but we can accept it. It really helps to remember that even though you might envision something unfolding in a particular way, you simply cannot account for all the factors that will change things. Make space for change to exist, and try to find some relief in knowing you cannot manage everything. When I invest in the seemingly mundane, I feel a little thrill in the daily activities I may have ignored before: The feeling of cold water on my skin when I wash my hands; the first bite of a meal; the moment in bed before I will myself up; getting a seat on the train ride home after a long day. Try fully immersing yourself in a mundane daily activity—even something as simple as brushing your teeth—and turning it into a moment to get present and reset. So much of what I do appears to be a means to an end. Eat lunch because you’re hungry; watch this film because you’ve heard it’s so good; go to this event because you ought to. Give yourself permission to pursue what brings you joy, simply because it brings you joy. But I find my anxiety start to dissipate when I do something simply because I want to. It can be simple and even a little silly—starting a 1000-piece puzzle, playing the ukulele, baking. Your breath is like the metronome of your mind; it can speed up or slow down your thoughts. In a moment of anxiety or nervousness, think: Am I holding my breath? In those moments, try to breathe fluidly and consistently. In through your nose, and out through your mouth. See if it impacts your sense of relaxation. Whether these tactics prove helpful or not, what’s most important is to remember you’re not alone. As critical-thinking human beings who have goals, plans, dreams, dates, and meetings, it’s natural to think eight steps ahead. As much as you can, greet your anxiety with compassion. Recognize it for what it is: A sign that you’re human. A sign that you’re invested in your life and its outcome. The next time you’re anxiously scrolling, remember: The people on the other side of that Instagram post or Tweet deal with it, too. And we all have the power to cope with it. Elisha Mudly is a South African born writer/actor/yogi/creator living in New York City.